Port Antonio holds an abundance of exotic splendor from the majesty of the Blue Mountains to the unknown depths of the famous Blue Lagoon; Port Antonio captivates. Errol Flynn called her "the most beautiful woman he had ever seen". 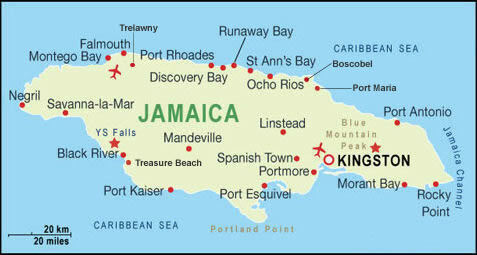 Port Antonio Jamaica was the island's first vacation destination. Over the years, glamorous visitors like Errol Flynn have found respite in the coastal town. Today, a Port Antonio vacation is a chance to escape the resort towns of Montego Bay or Ocho Rios or the urban buzz of Kingston. Port Antonio hotels are praised for their "green" tourism practices and the whole region has embraced environmental sustainability as a guiding principle. Port Antonio was renowned as the world's banana capital. Some claim that Jamaica's tourism was born here when banana boats returning from Boston, U.S.A. brought the first tourists to our shores. Portland offers an enchanting vacation experience. Glistening waterfalls, many of which are small secret gems, such as Scatter Waterfalls and Nanny Waterfalls, romantic coves with beautiful beaches, the magical Rio Grande River weaving its way through the deep valley and rolling hillsides covered with lush tropical forests and spectacular mountain views of Maroon Country. One of the best kept secrets in the Caribbean has always been Port Antonio, a tropical Eden and the jewel in Jamaica's crown. Portland offers visitors unparalleled natural beauty, exciting coastlines, romantic beaches, hidden coves, rivers and waterfalls with the Blue Mountain range providing a spectacular backdrop. Port Antonio, as the capital of Portland, has retained its charm as a quiet rural township and is home to one of the most beautiful harbours in the Caribbean. Navy Island, just off the twin harbours is a picturesque spot, once owned by Errol Flynn. It's worth taking the ferry and enjoying the view of the town with the hills rising above it. Dive down to the depths of Blue Lagoon or explore the caves both in and out of the water. A Port Antonio vacation is great for adventure travel. Many tour groups offer guided trips up the beautiful Rio Grande River valley to the Blue Mountains National Park. The waters around Port Antonio Jamaica are good for snorkeling and surfing, and famed for their deep-sea fishing.